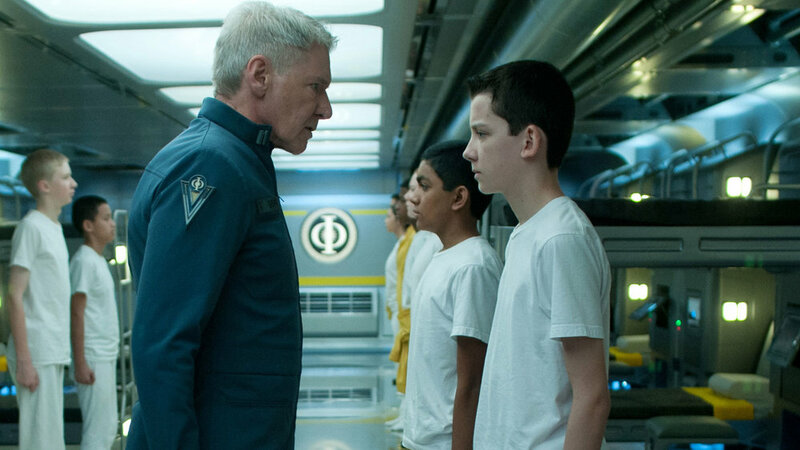 Ender's Game is a parable. It uses its hero Ender Wiggin, a tactical wunderkind tabbed to defend Earth from deadly aliens known as Formics in the near future, to explore the morality of pre-emptive strikes, of using the young to fight the wars of older generations, of whether the ends truly justify the means. These are interesting themes. Unfortunately, the film adaptation of Orson Scott Card's novel puts them in a jumbled and dull package. Card, who once called his 1985 novel "unfilmable" because so much of it is internal to his protagonist, wrote three scripts before finally seeing the film escape from development hell. I am not convinced that a fine adaptation would be impossible to shoot. But I am certain that Card should have waited a little longer or found another director or written a fourth script. Gavin Hood wasn't able to translate this in to the sci-fi film classic that such a beloved book would seem to deserve. Ender, who is played by Asa Butterfield, is defined by his intelligence -- his strength mental, not martial. This is established as he works his way from military school on Earth to Battle School in a space station near Earth to the International Fleet, the front line in the coming war against the Formics where a final round of training is what stands between him and an actual command. Ender's brilliance is his ability to empathize fully with his enemy, a talent that puts total victory -- even annihilation -- more easily within his grasp. This has its appeal to the likes of Harrison Ford's Colonel Graff, Viola Davis' Major Gwen Anderson and Ben Kingsley's Mazer Rackham. They are the adults in this tale, the leaders who -- the Formics' decades-old devastating attack on Earth in their memory -- are pushing Ender and company to help them eliminate the aliens once and for all. They rely on children like Ender and friends Petra (Hailee Stanfield) and Bean (Aramis Knight) because of their capacity for more rapid strategic adjustments. Every test which Graff and Rackham throw at the teenagers is designed to push them to the limit, to prepare them for a war that isn't so much physically dangerous as it is mentally deleterious. It actually makes for a pretty compelling dynamic at first, particularly at Battle School where Ender absorbs training in the form of an immersive mind game and strategic team competitions in an arena where all the competitors are weightless and the aesthetic resembles a hybrid of 1990s Nickelodeon shows GUTS and Legends of the Hidden Temple. It is in this setting that Ender's fragile genius is probed, from a distance, by Graff and Anderson, the importance of his progression in humanity's fight against the Formics known only to them. But eventually Ender must graduate, and with that development the dynamic goes from compelling to grating. The plot, which should be ratcheting up toward a climax, becomes increasingly incoherent, the tension of Battle School dissolving in to a series of scenes which essentially amounts to Ender and friends playing with their iPads and spouting poorly explained jargon in an attempt to save the world. Given the fact that it held my interest on both an emotional and intellectual level for quite some time, I can't help but wonder if Ender's Game simply lost its way or if it found it for as long as it possibly could, collapsing under the challenge of externalizing the conflict centered in Ender's head in the novel. I'll leave that to the subject matter experts and just say that I found this film adaptation profoundly unsatisfying.